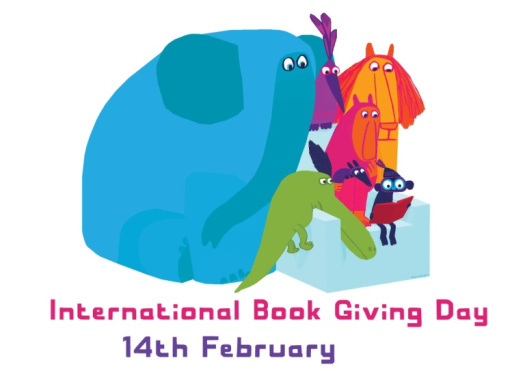 International Book Giving Day is coming on February 14th, 2019 and I would love to have my readers be able to participate in it. It is a great way to share the love of reading with children all over the world. This year the artist that has created the image for the posters has created a really colorful and whimsical depiction of animals reading together. Perfect, don’t you think? This year the selected poster images have been pulled from the archives and I love the ones that have been chosen. The above image was created by @chrishaugton , and used here with kind permission from Children’s Books Ireland. This second image is another fabulous one as well and is available in 5 different languages. Its message is timeless and offers suggestions of just how Book Giving Day works. This glorious poster from Priya Kuriyan. I think it is perfect. So how do you participate? Easy. 1 Buy a book ( or two or three). 2. Donate that book to a child. 3. Places to donate include waiting rooms, charities, schools, libraries, Little Free Libraries or directly to a child. 4. Take pictures and tag #BookGivingDay to share the love on social media. It doesn’t get much easier than this, does it? Free downloads of posters, bookmarks and bookplates are available on the website so share the love anywhere you can. Let’s make this the biggest year to date. 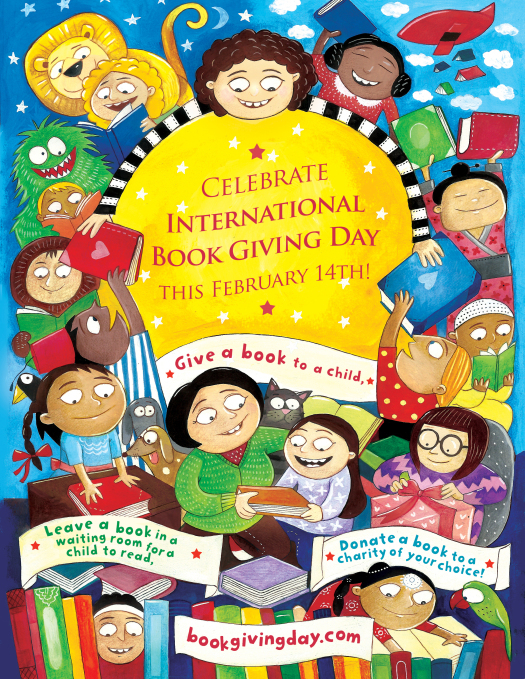 Download and print an International Book Giving Day bookmarkand/or bookplate to attach to a book you give. They’re free! Don’t forget to leave me a comment. I would love to hear what you plan to do for #BookGivingDay this year. Remember that each comment means a 50 cent donation to our Comments for a Cause – PAWS. You can read more about that by clicking here. Thank you Beth! What a wonderful day- makes me so happy just to look at the posters! Also, I don’t think my comment went through yesterday, but your post on mid-life friendships was so…well…friendly. A child can never have too many books. What a great idea and thank you for passing this along. I totally agree! I do an Amazon Prime box for my great niece every month what has two books. She has quite a collection already but I am always happy to gift books! What a great idea, I’ve never heard of this day before… On a related tip, remember that the post office has special reduced rates if you’re shipping books! That’s a great tip! Media mail is so much cheaper for mailing printed materials. Thanks for the tip! What a nice ideal It can bring joy to many. I agree! I am putting books in Little Free Libraries this year to celebrate.